Tanzania is an interesting origin for us for a few reasons but one stands out among the rest; we love peaberries! If you’re not familiar, a peaberry is a natural genetic mutation of the coffee seed inside the fruit that causes the development of a single, small, oval-shaped bean rather than two beans that are flattened and facing each other evenly. You can find peaberries throughout the coffee growing world, but Tanzanian peaberries stand out as one of the more commercially marketable and viable available. Tanzania has been a challenging origin over the last few years. With ever-changing government regulations, mismanagement, and lack of investment, we’ve unfortunately seen a decline of quality. This, in turn, led for our need to expand our presence in the country to build better and more sustainable relationships with producers, millers and exporters in the area. So with all this in mind, Richard and I traveled to Tanzania in October of 2018 to expand our horizons and source some new high-quality coffees from great new partners. The end result has so far been an incredible success. We’ve seen some of these coffees from our trip land in our warehouses, and will see more arriving through February and March. Located in the shadow of Mount Kilimanjaro, Lyamungo is one of four farms that make up the Africa Plantation Kilimanjaro estate. The estate is owned by Alejandro Galante, a coffee farmer from Antioquia, Colombia, with each farm managed individually. 95% of APK’s production is washed, though recent experimentation has led to more honey and natural processing occuring. Drying is done on raised beds, where APK employees carefully monitor the moisture level of each lot to ensure even drying. The Mbosho Estate is named for the village in which it’s located, just south of the famous Mount Kilimanjaro. Mbosho is managed by James Powell, a coffee industry veteran who gained experience owning a farm in Zimbabwe. He leases Mbosho’s land from the local society and oversees the production and processing of 40 hectares of coffee trees. This lot is washed using large tubs instead of the traditional channels; the estate doesn’t have space for large-scale channels often seen at other farms. Once washed, coffee is dried on raised beds and monitored constantly until it reached the appropriate level of moisture. The Tudley Estate is located in northeastern Tanzania near the base of Mount Kilimanjaro. Made up of mostly SL28 tree varietals, the Estate also produces Bourbon and Kent varietals, as well as a small crop of avocados and macadamia nuts. Coffee here is picked, then depulped and washed the next day. Drying is done on raised beds, with Estate staff carefully turning the coffee throughout the day. Drying takes between 10 and 15 days depending on the weather. Tudley is a large estate with over 180 permanent workers picking and processing more than 60 tons of coffee each year. The Kilimanjaro Plantation (KPL) was started in 200 in the shadow of Mount Kilimanjaro. Five years and almost a million new trees later, the plantation was up and operational. An interconnected drip-line irrigation system feeds each of the plantation’s trees, ensuring an equal and controllable water flow. This irrigation system boosts the natural ecological conditions caused by the proximity to Kilimanjaro and provides an excellent environment for growing coffee. KPL’s centralized wet mill replaced eight decentralized processing plants and allows for consistent high-quality preparation while reducing wastewater generated by the operation. The plantation staff takes ecological concerns seriously and has set standards that meet UTZ guidelines, as well as a consistent and comprehensive review policy. Three brand-new offerings have arrived at Royal New York from Kenya. All three are awesome examples of the classic Kenyan washed coffee; bright, tangy, a little sweet, and definitely worth a look. Supplies are limited, so be sure to contact your trader to check in about bag quantity and pricing! The Muiri Estate was founded in the late 1970’s, and is named for a local tree species in the Kikuyu language. Muiri is a large estate, with an on-site wet mill for processing, a dam, storehouses, and cottages for its workers. Muiri has about 156,000 trees in production, and is actively experimenting with other varietals and crops as well. This coffee is a blend of SL28, SL34, K7, and Ruiru 11. The coffee is washed, then dried on raised beds on-site. Cupping notes are defined by lemon rind, sweet tea, and plum. The Kaliluni Cooperative Society is located just east of Nairobi in Machakos county and is made up of just over 1,400 members. Each of these members delivers their coffee immediately after harvest to a centralized wet mill that handles the processing for the entire society. Harvesting is very selective, and the wet mill in Kaliluni turns out about 151 metric tons of high-quality green coffee each year. This lot is made up of the SL28 and SL34 varietals, and is grown between 1,450 and 1,800 meters above sea level. Coffee is washed, then sun-dried on raised beds. The resulting cup profile is bright but sweet, with notes of raspberry, sweet lemon, white sugar, and apricot. Based in Machakos county in southern Kenya, the Nzaini Cooperative Society is made up of about 546 members. The Society has a centralized wet mill in Nzaini where members deliver their harvested cherry daily for processing. Nzaini is part of a larger cooperative group known as Kikima, which is made up of more than 3,200 producers. This coffee is grown at around 1,400-1,800 meters above sea level and is made up of SL28 and SL34 varietals. Its has a classically bright washed Kenyan cup profile; with notes of grapefruit and hibiscus, rounded out with pear and raspberry sweetness. Look for excellent green coffee prep, a result of careful harvesting and sorting. This year’s crop from Burundi is arriving just in time to put an excellent end to 2018. We’ve got three lots of coffee that we’re particularly excited about, each profiled below. These coffees hit all the right notes you’d want from high-altitude washed African coffees, with sweet citrus notes abounding. These coffees won’t last long, so be sure to check in about them sooner rather than later! This coffee is produced by the Matsitsi Trading Coffee company, also known as Matraco. Its owner, Mr. Matsitsi, is a coffee producer in charge of the company’s three washing stations and more than 10,000 trees. Two of these washing stations are located in the north-central Kayanza province and another is under construction in the Muyinga province. Matraco has an excellent reputation for turning out high-quality coffees, winning Cup of Excellence awards in 2013, 2014, 2015, and 2017. Also from the north-central region of Burundi, this lot comes to us from the Ruhororo Commune in the Ngozi province. The washing station, Rimiro, manages the processing for over 1,700 farmers in the region with a combined total 500,000 coffee tress under production. Coffee is milled at the Budeca dry mill before being bagged and exported. Though the Kirimiro region of Burundi produces a lot of coffee, this lot comes specifically from producers with very new plantations. It’s processed at the Teka washing station, which is well-known in the area for processing Cup of Excellence winners. The washing station produces about 950 tons of green coffee each year, and has storage capacity for 80 tons of parchment at a time. Royal Coffee New York has sourced coffee from three main regions in Costa Rica for years; Tarrazu, the Central Valley, and the West Valley. There have been large lots and small lots, from full containers to very small single-producer micro lots. We’ve been very happy to work directly with producers, and consider them not only partners, but friends as well. Overall, this year we've been very happy with our arrivals from Costa Rica. The challenge over the last few years that we've run into has been bridging the gap between larger macro lots and the micros, and finding a quality level that everyone in the supply chain is happy with. The Las Lomas project was started to address that issue. To put together such a project, we needed to work closely with a local partner we knew could deliver a traceable, high-scoring “macro” lot. Coop Naranjo was the logical choice. The Coop has been around since the 1960’s, has a large network of producers, and is well-situated to guide the production of superior-quality coffee. In addition, Royal NY has a long history with Coop Naranjo dating back more than eight years. Through close cooperation with Coop Naranjo, we were able to design a program to source traceable, high-end lots of coffee from the West Valley in a way that was inclusive to all members of the coop and paid a price premium for superior harvesting and preparation. Traceability was key. Given the increasing demand to know where coffee comes from down to the individual producer in many cases, there needed to be constant, consistent conversations between the individual producers and the Coop that would allow for important information to be relayed and assure the best possible deliveries of fully ripe cherries for this project. To ensure quality, inspections would be done at every point in the production process. Agronomists would be sent to the individual farms to check maturation levels of the coffee trees at each participating farm, guaranteeing that cherries would only be harvested at the peak of ripeness. Further inspections would happen at the mill throughout processing, with feedback given to the producers as needed. Of course, if you produce great coffee, you should be paid fairly for it. 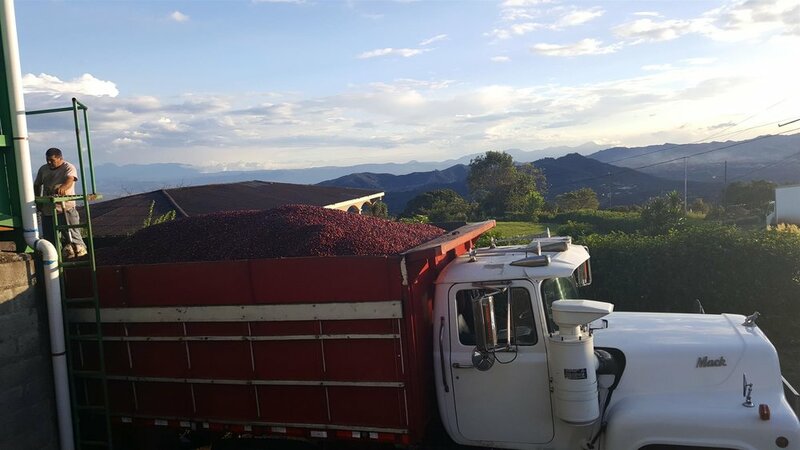 Since the standards (and labor costs) for this coffee are higher than what’s normally expected, a price premium was placed on the Las Lomas lots to encourage the highest possible quality. The project was open to all members of Coop Naranjo with farms between 1,300 and 1,700 meters above sea level, and offers an excellent opportunity for new producers to access new markets. Allowing all members of the Coop to join the project incentivizes the production of excellent coffee now, and into the future. We've cupped through six different washed offerings from a specific Loma or mountain range that was identified by the coop to produce higher quality coffee in Naranjo. We've selected three specific areas within that mountain range. Each of these lots are named below for their location; Canuela, Lourdes, and San Juanillo. Despite all of these coffees being from one specific mountain range in the West Valley, they each bring something a little different to the final cup. Please note that these coffees are offered in less than full container loads, and are in short supply. Please be sure to contact your trader if you're interested in carrying any of these coffee or want more information.